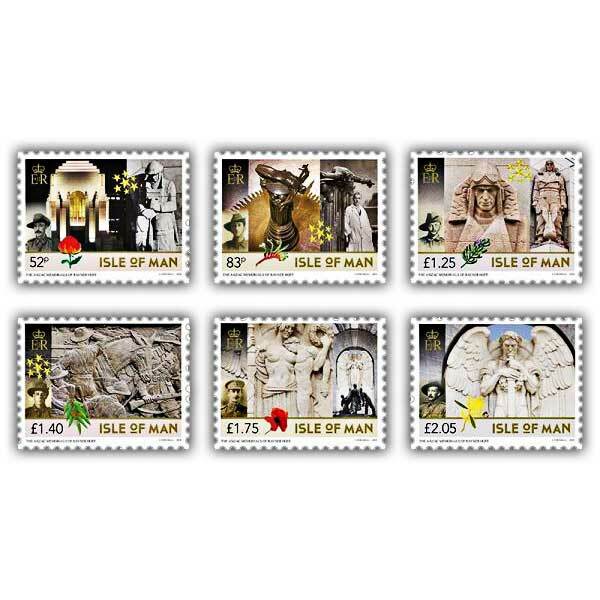 This year is the 100th anniversary of the end of World War One and we commemorate the final centenary with an issue of war memorials made by a Manx-born Australian sculptor, Rayner Hoff (1894-1937). Sculptor Rayner Hoff spent the first eight years of his life on the Isle of Man before moving to England and serving in the British Army during the Great War. After migrating to Sydney in 1923, he became an acclaimed artist and teacher. His war memorial sculptures in Australia have come to represent the spirit of ANZAC in his adopted country. These stamps have been designed by Australian designer Louise Cornwall in association with author Deborah Beck who recently collaborated on the monograph Rayner Hoff - The Life of A Sculptor published last year. 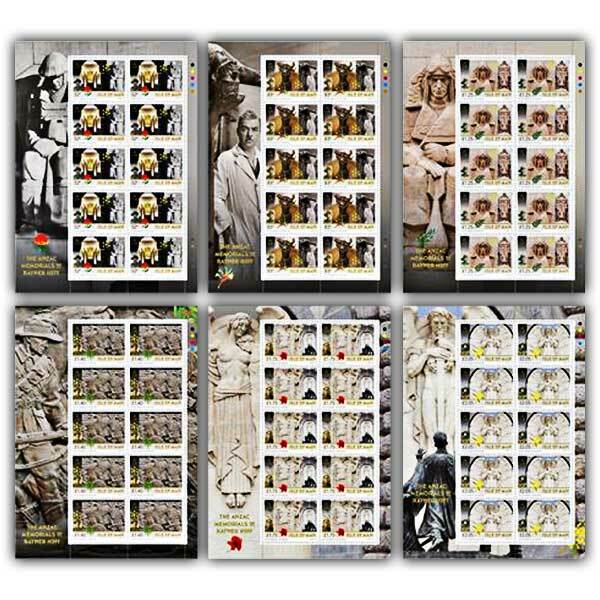 Each stamp includes a detail from the Sydney or Adelaide memorial and an image of a Manx-born or Isle of Man-descended soldier. 52p – Anzac War Memorial, Sydney, detail of soldier; Lance Corporal George Roberts; Waratah (Telopea), New South Wales state floral emblem. 83p – Sacrifice sculpture inside Anzac War Memorial, Sydney; Hoff with Sacrifce; Thomas Sayle Corlett; Kangaroo paw (Anigozanthos) Western Australia state floral emblem. £1.25 – Airman, Sydney Anzac Memorial, John Gell, rosemary, of particular significance for Australians as it is found on the Gallipoli peninsula. £1.40 – Bas relief on eastern exterior of Anzac War Memorial, Sydney; Robert Joseph Caley, Blue gum, Tasmania's state floral emblem. £2.05 – National War Memorial, Adelaide; John Joseph Corteen; Golden wattle (Acacia pycnantha), Australia's symbol of celebration, national unity and remembrance.